How to deal with severe constraints such as water vapour, humidity, ambient heat and aggressive jet cleaning in humid areas? 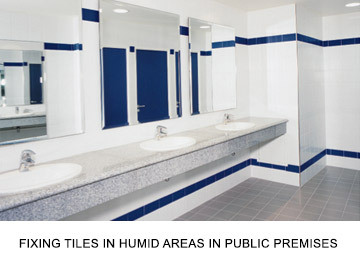 • PUBLIC TOILETS AND KITCHENS (UNLESS IF CLEANED WITH HIGH PRESSURE WATER JET: > 60 BARS). • HUMID PRIVATE AREAS WITH A SHOWER RECEIVER AND HYDRO-MASSAGING JETS ASSIMILATED TO PUBLIC AREAS. • PUBLIC LAUNDRIES OF A NON-INDUSTRIAL NATURE. • Before fixing the tiling, an identification and verification of the suitability of the substrate with regard to the constraints of the room or area will define the appropriate solution. • EPOGLASS - EPOSOL is recommended in areas subject to more demanding health and safety requirements. • Interior walls: concrete, cement mortar finishing coats, water proofed plasterboard partitions, "plus" or "super" (green colour), terra cotta tile partitions (cement built). * Totally unsuitable: all types of wood, metals, single coat finishes. • Up to 3600 cm2 depending on the adhesive mortar or adhesive. Refer to the Technical Data Sheet of the product used. DESVRES proposes a complete range of stoneware and earthenware coverings. WATER PROOFING OF SUBSTRATES: recommended on intermediate flooring and building partitions. Use: CERMICRYL, CERMIPROOF or CERMITANCHE, water proofing for floors and walls depending on the case. (1) Water proofing obligatory if the coating on the other side of the partition is water sensitive. Bond breaking substrates, standard range adhesive mortars may be used. • Use the CERMIJOINT COLOR - EPOGLASS - EPOSOL range depending on requirements. • EPOGLASS - EPOSOL is recommended for areas subject to intensive cleaning and recommended in areas subject to more demanding health and safety rules.